Pehpeh soup is a delicious blend of water, tomato paste, cayenne pepper, Harbeneros, black pepper, salt, garlic and thyme accompanied with meats or fish. 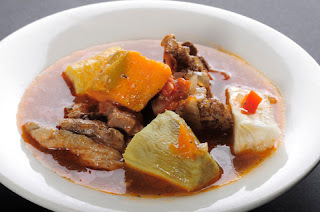 In most regions in Africa Pehpeh soup is cooked and served with boiled plantains, cassava, sweet potatoes or Yams. Pehpeh soup is similar to the Spanish Mondongo soup both in its preparation and use of ingredients. It can be made spicy or mild. Through out Africa Pehpeh soup is known not only for its tastiness but also for fighting common colds and fevers. I'm graving pehpeh soup!! How can I get the recipe?? ?